Unlike a clock radio, the Pure-Fi Dream is a premium bedroom audio system supported by 3/4-inch high-definition, soft-dome tweeters and 3-inch high-power, long-throw woofers. And by activating Logitech’s StereoXL™ technology, people can enjoy a wider soundfield that creates a quality audio experience. But the Pure-Fi Dream offers more than just great audio. The Logitech Pure-Fi Dream speakers use the latest motion-sensing technology. For controlling the Pure-Fi Dream in a dark room, the motion-sensitive, backlighted control buttons automatically light up when a person waves a hand over the top of the speaker; the buttons automatically dim when the person has finished changing the speaker’s settings. The backlighted buttons make it convenient to set the alarm clock without turning on the light or fumbling in the dark. The motion-sensing technology also extends to the Snooze function. Instead of hitting a button, one can simply wave a hand over the Pure-Fi Dream speakers to sleep for a few more minutes, eliminating the inconvenience of leaving the bed, inadvertently waking up a sleeping partner or accidentally knocking the iPod across the room. For those who prefer hitting the Snooze button with their hand, the Pure-Fi Dream also offers a prominently displayed tactile button located on the top of the system. 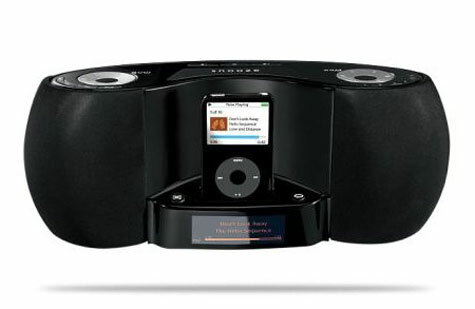 In addition to offering motion-sensing technology, Logitech also incorporated light sensors into the display of the Pure-Fi Dream iPod speaker system. The light-sensitive, auto-adjusting display brightens during the day, making it easy to read from across a room. The amber lettering clearly displays the time and date, iPod track information, radio stations and volume settings. And in the evening, when the display automatically dims, the speaker still provides information people want to see – including a one-of-a-kind LCD screen that provides track, song and artist information – without emitting unwanted ambient light. A premium accompaniment to any iPod, the Pure-Fi Dream speakers offer one-button access to iPod playlists and radio stations. There are 24 separate presets available – six iPod playlists, six AM radio stations and 12 FM radio stations. The speakers also offer dual alarms, providing two settings – one for each partner. The alarm can be set to go off to an iPod track or playlist, radio station, or buzzer. And with a built-in back-up battery, there is no need to worry about missing the alarm. For added convenience, with the included remote control, people can select their favorite iPod playlists, radio stations, control Volume, skip Forward and Back, Play, Pause, Shuffle or Repeat tracks, and Snooze the alarm from across the room. Like the speakers themselves, the remote control’s backlighted buttons make nighttime navigation easy. Part of the “Made for iPod” program, the Pure-Fi Dream speakers present an attractive piano-black finish and minimalist design that complements the iPod aesthetic. When an iPod is docked in the system, the speaker charges the iPod. To meet the diversity of iPod owners’ needs, Logitech also offers a family of speakers for iPod and MP3 players that includes the Logitech® Pure-Fi Anywhere™ Compact Speakers for iPod® (also announced today), the high-end Logitech® AudioStation™ speaker system, the lightweight Logitech® AudioStation™ Express portable speakers, the stylish Logitech® mm32 Portable Speakers for iPod and the flat-panel Logitech® mm28 Portable Speakers. The Logitech Pure-Fi Dream is expected to be available in the U.S. beginning in November. The suggested retail price in the U.S. is $249.99.